Getty Images/Business InsiderA composite image of Canadian Prime Minister Justin Trudeau and Saudi Arabia’s Crown Prince Mohammed bin Salman. 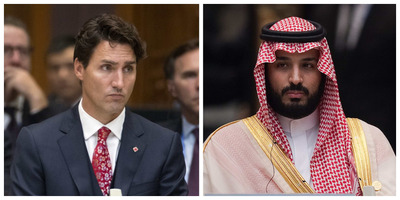 Canada and Saudi Arabia have been feuding since Canada’s foreign minister called out Saudi Arabia’s human rights record on Twitter in early August. In response, Saudi Arabia has expelled the Canadian ambassador, frozen all new investments, and canceled all flights to Toronto. It also pulled thousands of students from Saudi institutions. Thousands of students have to leave by August 31. Many are now scrambling to sell their belongings, including cars and furniture, online and in garage sales before they leave the country. The diplomatic feud between Canada and Saudi Arabia means that around 8,000 Saudi students studying in Canada have to leave the country by August 31 – leaving them scrambling to sell off their belongings. The Saudi government announced on August 7 that it would recall students on government grants or scholarships from Canada. Since then, students have been trying to sell all their belongings online and in garage sales – from pots and pans to chairs to cars. The Ummah Mosque and community center in Halifax, Nova Scotia, held two garage sales on August 12 and August 17 to help students to help the students sell their belongings. Imam Abdullah Yousri, who runs the mosque, said he decided to hold the sales when he saw so many students were trying to get rid of their stuff online. Here’s what the first garage sale looked like. It was so successful that the mosque held a second one for cars later that week. The cars on sale that day included 2010 Dodge Journey and a 2010 Hyundai Sonata, according to a Facebook Marketplace ad for the event. Those selling their cars online also revealed their sadness at having to part with their vehicles. Elsewhere, many students are selling tables, televisions, chairs, and shelves on Facebook Marketplace, while others are using Kijiji, a Canadian buy-and-sell website, to get rid of strollers and mattresses. Saudi Arabia announced on August 7 that it would withdraw all students it had been sponsoring in Canadian universities after Chrystia Freeland, Canada’s foreign minister, criticised Saudi Arabia’s human rights record on Twitter. Freeland had been responding to the news that the Saudi government arrested several activists, including the sister of a Canadian citizen. In response, Saudi Arabia expelled the Canadian ambassador, frozen all new investment, and canceled all flights to Toronto. Neither country is willing to back down, with Canadian Prime Minister Justin Trudeau saying on Thursday that his government is continuing to “engage diplomatically” with Saudi Arabia, but that he is “concerned” after news broke that a Saudi woman is facing a death sentence for her political activism. Canadian universities have been trying to support their Saudi students in wake of the new policy. Five universities said on Wednesday that the Saudi trainee doctors enrolled in their programs had been granted an extra three weeks in the country, and can stay until September 22, according to Reuters. The University of Toronto’s vice-provost for international student experience, Joseph Wong, also said in a statement: “This is a very stressful time for these students. Their studies have been interrupted, and we want to help them to continue their education.